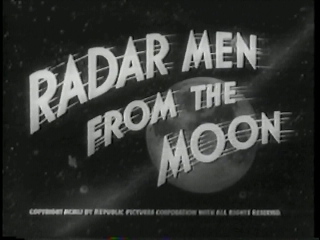 Radar Men From the Moon (1952): This show is definitely for little kids ages 6-8 tops. I don't think kids much older than that would really get a thrill out of it. There are so many nonsensical things that happen along the way that it would be impossible to list them all, but I will hit the highlights. Nostalgia buffs like me love this show because it's history and it's fun. Be that as it may, this serial is incredibly simplistic. The basic premise of the show is that men from the moon are plotting to invade the Earth. Commando Cody and his crew of scientists try to stop them. At the beginning of every chapter we're told that "Commando Cody" is a new character. A new name, perhaps, but the character had already appeared in two serials before this. He was originally called Rocket Man, but he looked the same and had the same basic function. Even Aline Towne, who played Joan in this serial, appeared in the previous "Zombies of the Stratosphere" from this same year. Here is a rundown of all the Rocket Man/Commando Cody shows produced. You've got to love this show, even with its faults. It's unintentionally hilarious. The dialogue is phony as all get out, but keep in mind this was aimed towards younger audiences so they could understand what was going on. All the actors are good, it's just the script that's silly. There is no real plot...stuff just happens. This was a twelve-chapter serial; the whole story could've been done in three chapters. 3. And "cooking their meals" as it was put in Chapter 1. The way Joan's character is treated is SO typical of 1950s cinema. As you may know, one of the most common things in movie serials was women getting knocked out all the time. That, and the whole "this isn't a job for woman" speech that they're told all the time. She's basically eye-candy, and a reason for fathers to take their kids to see this serial every week. The actress who plays her, Aline Towne, is very pretty. I like her a lot. She acts well, but just isn't given the heroic spotlight of Cody. Basically a "damsel-in-distress" role. The very title of this serial is misleading. "Radar Men From the Moon" may sound cooler than "Atomic Men From the Moon", but the latter is more accurate. The moon men use a lot of atomic guns. Radar is barely even mentioned in this serial, except for Chapter 3 for a few brief minutes when they're using radar to track down Cody's spaceship in order to shoot it down. Other than that, EVERYTHING is atomic. One last silly thing worth mentioning is: "How come the moon looks EXACTLY like the desert on Earth where Cody's ship launched?". * The concept of the Commando Cody character. I like the idea he's a scientist/superhero whose identity isn't at all secret. He's very much like the Fantastic Four would be a decade later in the respect that everyone knows their names and what they do for a living. Cody's costume is cool, too. It seems to me that he must have been a direct inspiration for "The Rocketeer" film character four decades hence. * The scenes of Commander Cody in flight are great. It's always been difficult for filmmakers to convincingly show a flying man, but this film does it very well. Consider the fact that these scenes were done in the primitive days of movie special effects and you will be amazed, too. Cody flying looks believable, which is good because it's an important part of what he does. * They show a lot of disaster footage throughout the serial. The filmmakers at Republic Pictures actually borrowed this footage from a lot of earlier Republic serials. It doesn't matter. The footage is quite excellent. Lava flows, oil rigs blowing up, trains derailing, and similar things show up great on film, and they're cleverly worked into the story. * The car chases are excellent! One reason is that all the cars are classic cars when cars still looked good. Another reason is that the stunt driving is a bit riskier than in shows with car chases made today. Real crashes and crazy driving make for movie excitement. * Aline Towne, as Joan, is HOT! * Last, but not least, is Clayton Moore (TVs "Lone Ranger") as thug Graber. I've always liked Clayton Moore because it looks like he can beat people up. He's got quite a build to him, and he's just as convincing as a bad guy as he is a good guy. This is a show I think any film buff has to see at least once. It's one of the most famous science-fiction epics ever. Besides that, this is a fun show to watch even for the substandard production. It's all optimistic, encourages imagination in the minds of little children, and makes you happy when you see it.